Perhaps inspired by Pound's public engagement with Japanese themes, Ernest Fenollosa's newly-widowed wife made arrangements in late 1913 to send the orientalist's unpublished scholarly papers to Pound. Ernest Fenollosa. "Translation of Chinese classics including poetry," v. 1 of 2. A. MS. line-by-line translation of poems by Rihaku (Li Po) transliterated by his Japanese teachers Mori and Ariga. Tokyo, ca. 1900. Ezra Pound. Cathay: For the Most Part from the Chinese of Rihaku, from the notes of the late Ernest Fenollosa, and the Decipherings of the Professors Mori and Ariga. London: Elkin Mathews, 1915. 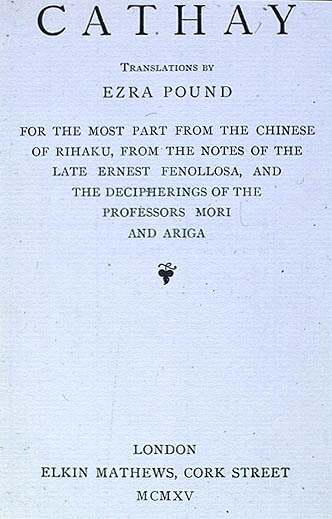 Upon receiving Fenollosa's scholarly papers, Pound poeticized a number of Fenollosa's line-by-line translations of the works of Chinese poet Li Po (Rihaku in Japanese), publishing the result as the much-noted volume Cathay. James Legge, translator. 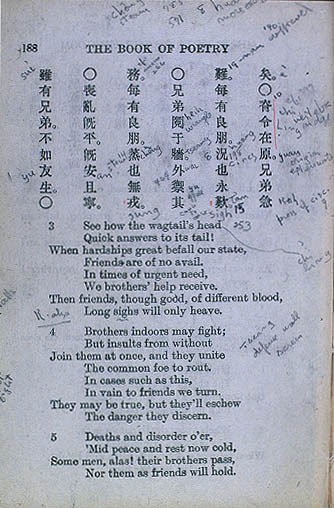 The Book of Poetry (Shih Ching). 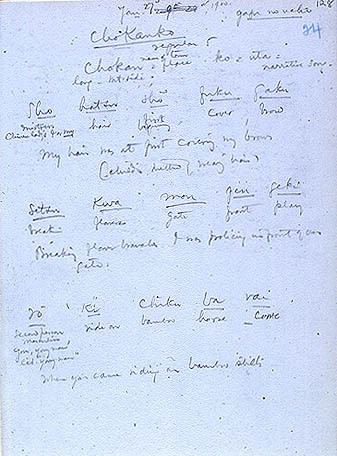 Copy owned and annotated by Ezra Pound. Shanghai: Chinese Book Co., 1903. 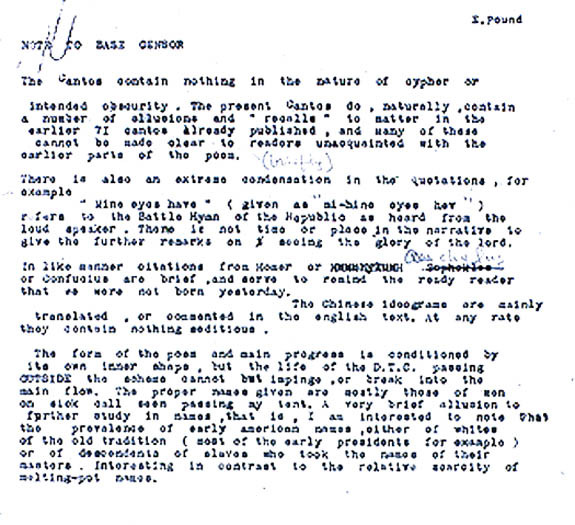 Pound began to teach himself Chinese and by 1940 Chinese characters and ideas took a central place in the text of his Cantos. Ezra Pound. "Canto LXXIV," part of The Pisan Cantos, with a "note to base censor" that the ideograms contained nothing seditious. T.MS. with autograph corrections and ideograms. Pisa, 1945.